Hard drugs aren’t a problem in the Midwest. Right? The New York Times reports that in Milwaukee County alone, 299 people died of an opioid overdose last year. This is an increase of 44 people in 2015. Opioid overdoses kill more people than car crashes or gun-related homicides. They kill women, children, men and people of all races, ethnicities, and classes. They kill people in the west, the east and, yes, the Midwest. Opioid addiction is an epidemic; a crisis that impacts all 50 states. On May 5th, the National Occupational Research Agenda (NORA) Symposium targeted the opioid crisis for its annual outreach event. 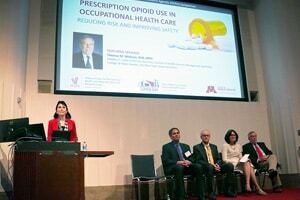 The 2017 NORA symposium titled “Prescription Opioid Use in Occupational Health Care: Reducing Risk and Improving Safety” was co-sponsored by the Upper Midwest Agricultural Safety and Health center (UMASH) and the Midwest Center for Occupational Health and Safety (MCOHS). The symposium focused on raising awareness, providing continuing education, and sharing research about the opioid crisis in occupational and agricultural health. 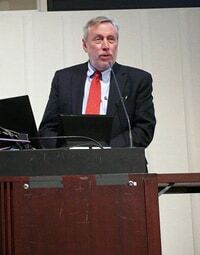 Dr. Thomas Wickizer, a widely regarded health services and policy expert, was the featured speaker. Dr. Wickizer has done extensive research with drug abuse focusing on the opioid epidemic and highlighted its impact in the workforce and the workers’-compensation insurance system. While workers’-compensation can pay for the medical care and prescribed medications for injured workers covered by this insurance, the worker is at a much higher risk for addiction if the prescription is not limited to a short duration. There is little medical evidence of any long-term benefits of opioids for chronic pain (lasting more than 3 months) that is unrelated to cancer. According to Dr. Wickizer, in the early years of the outbreak, 42% of workers with chronic back pain were prescribed opioids, and 16% continued after a year. This accounts for 15%-20% of employer costs in long-term claims. Farm and agricultural workers are at an even greater risk. In the U.S., agriculture remains one of the most dangerous occupations. While handling labor intensive tasks and heavy machinery, farmers are more likely to be injured or endure chronic pain—”a key reason we want to raise awareness on this issue among agricultural communities,” says Dr. McGovern. Although there is no simple solution to solve the opioid epidemic, the NORA symposium advocated for change. Dr. Wickizer calls for change by medical providers to prescribing opioids consistent with guidelines provided by The Centers for Disease Control and Prevention (CDC), their state medical boards or professional medical societies. The CDC’s Guideline for Prescribing Opioids for Chronic Pain is intended for primary care clinicians treating adult patients for chronic pain in outpatient settings. Dr. Wickizer also highlighted the importance of drug monitoring programs and a collaborative care approach for patients. 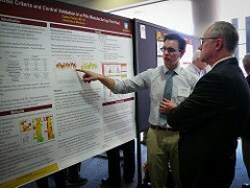 The symposium also showcased research from University of Minnesota students and faculty. Graduate students in the field of occupational health and safety displayed posters describing their collaborative research and findings. “NORA allows professionals to get continuing education, network, and share ideas with other professionals, students and faculty,” says Dr. McGovern. The hold that opioids have over our country has sparked research and education to help release our nation from the burden of this epidemic. The crisis extends far beyond a person’s addiction and touches every aspect of our culture. The health and safety of employees is just one of those areas. 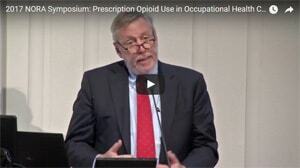 The NORA symposium helped raise the consciousness of our occupational health and safety community on the need for continuing awareness, education, and further research on the opioid epidemic. View a video, photos, and a list of posters from the 2017 NORA Symposium.